One of the greatest challenges in protecting the climate is reducing emissions of particulate matters and sulphur and nitrogen oxides. In order to continually reduce the levels of these emissions, we are committed to developing alternative, low-emission options for electricity generation and usage for ship operation. We promote the use of innovative environment and efficiency technology. As a market leader in Germany, we feel that we have an obligation to act as a role model and a trendsetter. An open exchange of knowledge, ideas and various perspectives is an integral part of our corporate culture and is put into practice every day. Following the commissioning of the latest members of our fleet, AIDAprima (March 2016) and AIDAperla (April 2017), AIDA Cruises is now a pioneer in the cruise industry where protecting the climate and environment is concerned. Back when both ships were ordered in 2011, we took the most innovative technology available at the time into account in order to build cruise ships that meet the most recent requirements of energy-efficient and eco-friendly ship operation. AIDAprima and AIDAperla are the first cruise ships in the world to be fitted with a dual fuel engine and can therefore be run on low-emission liquefied natural gas (LNG) while docked at port and for around 40 percent of the overall running time. They are moreover equipped with two cold ironing connections and a multi-stage exhaust gas cleaning system, which can reduce particulate matter, sulphur oxide and nitrogen oxide emissions by up to 99 percent. AIDAprima and AIDAperla are thereby fully equipped to make use of every kind of low-emission energy production technology currently available. The striking vertical bow and optimized hull shape improve the hydrodynamic characteristics of the vessels. Other new features that contribute to improving energy efficiency and therefore to reducing fuel consumption are the latest pod drives and the innovative MALS technology (Mitsubishi Air Lubrication System). These allow AIDAprima and AIDAperla to glide over the water on a carpet of air bubbles with minimal resistance. State-of-the-art technologies such as absorption refrigeration machines and extensive use of waste heat ensure our hotel and restaurant facilities are as extremely energy-efficient. Innovative technology is widely utilized on AIDAprima and AIDAperla. We run the other ships in our fleet in accordance with the highest environmental standards too, and retrofit them wherever possible with the latest technology as part of our efforts continually to improve our environmental footprint. The sections that follow detail the measures we have implemented. Of all of the fossil fuels currently available, LNG (liquefied natural gas) is the most environmentally-friendly. Based on the state of technology today, using LNG is currently the lowest-emission option for powering a cruise ship. In comparison with conventional marine diesel oil with 0.1 percent sulphur content, the emissions from using LNG are drastically lower. LNG releases almost no sulphur oxides or particulate matter. Emissions of nitrogen oxide are reduced by up to 80 percent and CO2 emissions are lessened by around 20 percent. AIDA Cruises is a pioneer in the use of LNG in cruise ships. We are certain that, based on the current state of science and technology, the eco-friendliest method of powering future generations of cruise ships will be with LNG. AIDAprima and AIDAperla are currently the only cruise ships in the world that, thanks to duel fuel engines, can produce around 40 percent of their energy requirements from LNG both at sea and while docked at a port. LNG must be available in the respective port in order to achieve this. As of May 2016, AIDAprima can use LNG in Hamburg, Le Havre, Rotterdam, Zeebrugge and Southampton. The LNG is supplied to the ships via LNG trucks. When AIDA Cruises commissioned the first two cruise ships capable of being powered solely with LNG in the summer of 2015, the company gave a clear signal of its intent to reduce its emissions even further. The first steel cut in the construction of the new generation of ships took place on 21 February 2017. AIDAnova, the first ship of this new series and built to the same design, will be put into service in autumn 2018, and its sister ship will follow in the spring of 2021. In around four years’ time, roughly half of all AIDA guests will be able to travel on ships that use LNG. LNG, or liquefied natural gas, is obtained from natural gas, a carbon compound that principally consists of methane (but also of ethane, propane, butane, ethane and pentane). At temperatures below -163° Celsius, under atmospheric pressure natural gas becomes a liquid, and is therefore more transportable and storable. LNG is stored in thermally insulated tank containers, which can be transported by lorry, train or tanker. Aside from being obtained from fossil fuel deposits, LNG is also produced with the help of regenerative energy sources. At AIDA Cruises, safety is our topmost priority. Using liquefied natural gas (LNG) to power a ship entails no greater risks than other types of fuel - in fact, the opposite is true. The use of LNG in shipping is regulated by the International Code of Safety for Ships using Gases or other Low Flashpoint Fuels, or the IGF Code. By adhering to the IGF Code, it is possible to keep any potential hazards that the fuel used on the ship may pose to the crew or the environment to a bare minimum. The code contains mandatory stipulations for the design, assembly, control and monitoring of machines, equipment and systems in which fuels with a low flash point (such as LNG) are used. It is a high-energy fuel which dissipates very slowly in air, meaning it is almost impossible to cause an explosion through excessive pressure. At 580°C, the auto ignition temperature of LNG is much higher than that of diesel fuel at 250°C. All crew members at AIDA Cruises who have direct contact with LNG undergo further instruction with regard to LNG in addition to their normal training and possess all the necessary certification. In collaboration with Becker Marine Systems, a few years ago AIDA Cruises launched another pioneering pilot project in Hamburg - the LNG hybrid barge. The world’s first LNG hybrid barge was launched on 18 October 2014 in Hamburg’s Hafencity and was named ‘Hummel’ (Bumblebee). In May 2015, AIDAsol was powered with electricity generated using LNG during its layover in Hamburg’s Hafencity, and on 16 further calls throughout 2016. Through the use of this floating liquefied gas power plant, gas and particulate matter emissions were drastically reduced. So how does the LNG hybrid barge work? The cryogenic liquefied gas (at -163 °C) is heated in the gas treatment system on board the barge and then fed into the generators, which in turn produce the electricity. The power output that is made available by the five gas engines on the LNG hybrid barge is 7.5 megawatts. The electricity can then be directed from the LNG hybrid barge through a cable to the ship or another shore-based consumer. In comparison with conventional marine diesel oil with 0.1 percent sulphur content, the emissions from generating electricity using liquefied gas on the LNG hybrid barge are considerably lower: LNG releases almost no sulphur oxide or particulate matter. Emissions of nitrogen oxide are reduced by up to 80 percent and carbon dioxide emissions diminished by around 20 percent. It is the stated aim of AIDA Cruises to reduce the emissions produced by its fleet as much as possible, in particular the emissions of particulate matter and nitrogen and sulphur oxide. AIDAprima and AIDAperla are fitted with a complex, multi-stage exhaust gas treatment system called an EGCS (Exhaust Gas Cleaning System). Following many years of research carried out by the Carnival Group, it is now possible to design and combine all three components required to reduce the emissions of particulate matter such as sulphur dioxide and nitrogen oxide so compactly that they can actually be incorporated into a cruise ship as a single system. Nitrogen oxides are fed into a catalyst in which particulate matter and fuel residues are filtered out. Sulphur dioxide (SO2) is converted into sulphite (SO32-) through the addition of sea water, converted and released back into the sea with the washing water. In saltwater sulphite are transformed to sulphates (SO42-) which is one of the most common and natural compounds in the world’s oceans. With this technology, for the first time we are now able to reduce particulate matter, nitrogen oxide sulphur oxide emissions by between 90 and 99 percent. Through this process, emissions of carbon monoxide are also diminished by 70 percent and emissions of unburned hydrocarbons by 85 percent. For more information, please follow this link. We have already retrofitted the systems on four of the ships in our fleet with this equipment. As a result, 6 of the 12 ships in the AIDA fleet have setups of this system on board that have been adapted to the structural conditions of each respective ship. As with other new technologies, this transition is a very complex process which is also dependent on the planning and manufacturing capacity of the supplier companies. The exhaust gas cleaning systems on all six ships have received technical approval. These systems will also be used at our destinations and ports around the world where we have been granted the relevant permissions. On average, AIDA ships spend around 40 percent of their operational life in a port. Even while moored, they are supplied with energy to ensure that onboard systems continue to operate. A decisive factor in our choice to use cold ironing is that electricity is produced in a more eco-friendly manner on land than on a ship, even with modern onboard systems. However, cold ironing only contributes to conserving the environment if it uses green electricity (generated using renewable sources). Of the 12 ships that currently make up the AIDA fleet, three ships – AIDAprima, AIDAperla and AIDAsol – are already fitted with cold ironing connections, and a further 6 ships are ready to utilize cold ironing. Together with our partners in Hamburg, following the completion of the test phase in 2016 AIDA Cruises has taken a further important step towards conserving the environment and improving air quality in the city of Hamburg. As of late April 2017, while moored in Hamburg Altona, AIDAsol can now be supplied with 100 percent green electricity via a cold ironing plant. Alongside reducing emissions, increasing energy efficiency is another vital criterion for operating a ship in an environmentally friendly manner. The hydrodynamic improvements made to AIDAprima and AIDAperla help to promote energy conservation. Thanks to its striking design with a vertical bow and optimized hull shape, a significant portion of the ship’s propulsion can be saved. AIDAprima and AIDAperla are the first cruise ships in the world to be equipped with the innovative MALS technology (MALS = Mitsubishi Air Lubrication System). This allows the ship to glide along on a carpet of air bubbles, which considerably reduces friction and conserves propulsion. The latest pod drives likewise make a significant contribution to reducing fuel consumption. The drive is installed in a streamlined nacelle and is able to rotate 360° around its vertical axis, which makes the ship extremely maneuverable. The best ton of fuel is the one that we never used in the first place. In comparison with levels in 2007, we have been able to reduce our fuel consumption per guest and per day of travel by more than a third. An AIDA ship now consumes an average of just three liters of fuel per person for every 100 kilometers travelled. The independent experts at the ship classification association DNV GL have released a report which confirms these figures. By implementing numerous measures aimed at improving energy efficiency and hydrodynamics, we have been able further to reduce the fuel consumption of AIDAprima and AIDAperla. A further possibility for making fuel savings is to create optimal speed profiles corresponding to the various legs of a trip undertaken by an AIDA ship. In this way, and through effective route management and optimized timetables and layovers, we have been able to save additional fuel. An improved hull and propeller design likewise helps us to conserve operating power. All AIDA ships are moreover painted with an underwater coating, which is replenished on a regular basis and which prevents fouling of the underside of the ship. This coating reduces friction while the ship is in motion, thus also reducing fuel consumption and emissions. We continually improve the methods we use to recover waste heat on board our ships. We use the heat regained from the cooling water in the engines and distribute it to consumers in other parts of the ship. This means we can reduce the amount of energy needs to be produced. The aim is to reduce the fuel requirements of the oil-fired boilers and at the same time to boost onboard fresh water production. All of the cabins on board our ships that have been commissioned since 2010 have been equipped with a modern air circulation system with heat recovery, which means the temperature in the cabins can be controlled individually (HVAC Control System). This modern technology reduces energy consumption in the cabins by up to 20 percent. We only use cooling agents that do not harm the earth’s ozone layer in order to power our air conditioning systems. Taking this step allowed us to reduce our emissions of ozone depleting cooling agents to zero. On board AIDAprima and AIDAperla, so-called ‘absorption refrigeration machines’ facilitate further savings in fuel consumption. We conserve around 30 percent of the required energy in the hotel areas of our ships by using innovative lighting solutions such as installing LED lights and a comprehensive light management system. These have already been introduced on 9 of our 12 ships. In order to conserve even more energy, we naturally need the assistance of our employees and our guests. Our ships that have come into service since 2010 are fitted with a hotel card switch enabling our guests to switch the electricity to power the lights in their cabin on and off by inserting or removing their room key to prevent lights and air conditioning units being left on unnecessarily. The standard electric motors on board AIDAprima and AIDAperla are classified in the IE3 Premium Efficiency energy efficiency class. Braking energy generated by the on-board lifts is fed back into the electrical system. Frequency-controlled engines and speed-controlled pumps and fans ensure that only the power that is genuinely needed is called upon. Further onboard processes are also being continually developed and optimized. In the hotel industry on land, it is common practice to change and wash bedding and hand towels on a daily basis. For cruises on our ships lasting one week or less, bedding and hand towels are only changed during the voyage when specifically requested by a guest. Where washing is concerned, this saves not only 50 percent of the water and washing powder that would otherwise be required, but also half of the energy that would be needed to wash and dry the bed sheets. Our tunnel washers on board AIDAprima and AIDAperla make the washing process even more energy-efficient. Another important energy-saving measure aimed at reducing our fuel consumption is the EMMA energy monitoring and management system, developed by ABB, which was installed on all of our ships in 2015. We have been setting new standards for energy management across our fleet by using the innovative Energy Monitoring and Management System ‘EMMA’, created by ABB, on board all of our ships since 2015. In addition to constructing a comprehensive database of operational and technical information, the key benefit of the system is its ability to provide decision-making support in real time in order to optimize the running of the ship and its systems. One of the most important features is the direct connection to the ship’s automation system and to the onshore organizations of AIDA Cruises. Thanks to its all-encompassing scientific approach to analyzing operational data, EMMA has enormous potential for further improving the energy-efficiency of the fleet. For us, it is important to analyze the energy management on board our ships objectively and scientifically in order to achieve maximum efficiency in everyday practice. In total, up to 500 signals are sent by each ship’s automation system to EMMA every second. The seven most important categories that can be monitoring through EMMA are propulsion, propulsion efficiency, the trimming of the ship, hotel and auxiliary power supply, air conditioning per person, specific fuel consumption of the main diesel generators and the overall fuel consumption. From this, the crew can obtain valuable information that allows them to break down the individual parameters in detail and as needed. The systems and individual nominal values on board can thus be adjusted if necessary with the aim of ensuring that the ship is running efficiently. Practical examples of such adjustments include changing the engine configuration and load, route planning with speed management or optimizing the trim or heat recovery. We have fitted AIDAprima and AIDAperla with the latest technology which increases the overall efficacy of energy production. Our ships are setting new benchmarks in energy efficiency in the operation of hotels and restaurants on cruise ships through extensive use of heat recovery technology, as well as intelligent distribution and usage of heat given off by machinery. Waste heat is utilized efficiently by being passed through dual waste heat boilers, which means oil-fired auxiliary boilers very seldom need to be used. The entire waste heat, including that given off by the engine coolant, is fed into a centralized waste heat distributing system and forwarded to the individual consumer parts that have the highest energy requirements at any given moment. The available energy is utilized efficiently and precisely using a centralized distribution system and intelligent demand management. AIDAprima and AIDAperla are both equipped with absorption refrigeration machines. These convert excess waste heat into cold air for the air conditioning systems and thereby reduce the demand for electrical energy. Air conditioning systems are the next largest consumer of energy on board after the main engines. The cold air is produced efficiently either via the absorption refrigeration machines from the waste heat given off by the machinery, or directly by cooling down sea water. This means that onboard air conditioning compressors need only be switched on when air and water temperatures reach their peak in the height of summer. The air conditioning units in the cabins and communal spaces are controlled locally and intelligently via fan coils. All of the cabins on board AIDAprima and AIDAperla are also equipped with a modern air circulation system, which includes a heat recovery system (HVAC Control System). We believe the key question is not so much what kind of fuel we use, but how we achieve the greatest possible reduction in emissions. In recent years, the development of a multitude of technical innovations in relation to alternative forms of energy production in shipping has been initiated. Nobody is able to say today exactly which of these technologies will be used all over the world in the future. AIDA Cruises has invested considerable sums of money to ensure that we are primed to make use of all technically available forms of energy production. Using liquefied natural gas (LNG) makes a significant contribution to reducing emissions. At present, LNG is the lowest-emission fossil fuel available on the market. At AIDA Cruises, we are convinced that LNG represents a sustainable solution for ship operations in the future. We are already a pioneer in the use of this low-emission fuel in cruise shipping. The use of LNG currently represents the most environmentally-friendly solution for ship operations, as this fuel releases almost no emissions. When LNG is used, almost no particulate matter or sulphur oxides are released, and in comparison with marine diesel with 0.1 percent sulphur content, nitrogen oxide emissions are around 80 percent lower and carbon dioxide emissions around 20 percent lower. This is why we are consistently pursuing our LNG strategy going ‘forward. >> More information on this topic can be found in the sections titled ‘LNG – The fuel of the future at AIDA’, ‘LNG operation with dual fuel engines’, ‘LNG hybrid barge’ and ‘cold ironing’. We are supporting the phased plan developed by the IMO (International Maritime Organization) aimed at reducing ships’ emissions and also implement measures that go beyond the aforementioned initiative. AIDAprima, AIDAperla and all of the new ships currently under construction are fitted with dual fuel engines, which can also run on LNG. Essentially, the use of low-sulphur fuels in important travel areas has already been a reality for several years. In the North Sea, the Baltic Sea, off the coast of America and in a number of other Sulphur Emission Control Areas (SECA), we exclusively use low-sulphur fuel with a maximum sulphur content of 0.1 percent. Our engines have run exclusively on marine diesel oil with a maximum sulphur content of 0.1 percent in all of the European ports since 2010. AIDA has done this voluntarily in the port of Hamburg since 2007. A study carried out by the University of Delft in April 2016, which was commissioned by the ‘Nature and Biodiversity Conservation Union’ (NABU), confirmed the significant decline in emissions in the North Sea and Baltic regions thanks to the use of low-sulphur fuels. In comparison with 2014, in 2015 sulphur emissions on the island of Neuwerk near Hamburg decreased by around 50 percent. According to the Federal Environment Ministry, overall sulphur emissions in Germany fell by around 90 percent between 1990 and 2015. With regard to CO2 emissions, cruise ships have been demonstrated to be one of the most efficient means of transport. Professor Holger Watter from the Maritime Centre at Flensburg University of Applied Sciences is an acknowledged expert in sustainable energy systems. He explains that “only three percent of CO2 emissions are released by maritime shipping. Ships are the most efficient means of transport, with emission levels that, as measured by transport capacity, fall below those of other modes of transport (lorry, train, aircraft) by several orders of magnitude. Maritime ‘power plants’ can achieve a degree of efficiency that far exceeds that of land-based systems.” In addition to offering a means of transport, cruise ships also offer hotel accommodation, restaurants and leisure activities. These additional services also leave their mark on our environmental footprint. We have reduced our overall on-board energy consumption per person and per day by 1.87 percent in comparison with the previous year. Systematic waste management on board is standard at AIDA and is regulated by the provisions set down by MARPOL. Disposal facilities in the ports where our ships dock are thoroughly investigated as early as the route planning stage. Based on the findings of these investigations, the waste management process for each voyage is planned in such a way that we make use of the most environmentally friendly disposal methods available. Waste separation has been a regular feature of life on board AIDA’s ships for many years. Metal is compressed to save space and glass is crushed. Food waste is likewise compressed and drained. The result is a fully biodegradable substance, comparable with the kind of compost briquettes that can be purchased at a DIY store. Moreover, since early 2016, aluminum has been collected separately from other metals on board some of our ships. Aluminum and other metals are collected in separate containers. After checks to ensure the separation was completed correctly, the aluminum is sent ashore separately and recycled. In 2016, we began a pilot project on board AIDAprima, the purpose of which is to dispose of PET bottles separately. To this end, PET bottles are collected separately from other plastic waste on board, which are then compacted and handed over to certified waste disposal companies for recycling. AIDA works with the best waste disposal companies at all of its destinations. Wherever possible, we make use of the services of certified disposal companies. This is certainly the case in every European port. For other destinations which have not yet developed the equivalent standards, we choose the best available alternative in each case. In order to ensure that waste is disposed of appropriately, our environmental officers visit the waste disposal company in person and carry out audits and inspections at the port itself. No matter how well our disposal system functions, it is even better to produce as little waste as possible. This is why we work hard continually to reduce our waste accumulation per person and per day. Between 2012 and 2016, we were able to reduce the amount of waste produced per person per day from 4.6 to 4.0 kilograms. Many drinks on board are no longer purchased in bottles, but instead in special large volume drinks containers. In numbers, this means that the roughly 3 million liters of barreled wine supplied to our ships each year are now in reusable 1,045-liter containers rather than in conventional bottles. This allows us to cut down our usage by the equivalent of 4.2 million 750ml wine bottles. These same measures also enable us to reduce the following packaging waste: 6 million 330 milliliter soft drink cans, 5.75 million 330 milliliter beer bottles and 800,000 1-liter fruit juice extract tetra packs. Even the smallest changes can often have a huge impact. By switching to a 10-centimeter narrower plastic wrap, for example, we were able to reduce our plastic wastage in the kitchens. We have furthermore replaced numerous disposable products, such as tasting spoons in the kitchens, disposable aprons and disposable bottles, with reusable products. We ensure that any disposable products still in use on board, such as paper napkins, are biodegradable wherever possible. The material from which the paper napkins are made is 100 percent compostable and has been awarded the NORDIC SWAN LABEL (ISO 14024) - the highest environmental standard. Nordic Swan is one of the strictest environmental certificates in Europe and all its criteria are checked every 3 years. AIDA Cruises strictly fulfills the high international environmental standards for the treatment and disposal of sewage water in the maritime industry and even partially goes beyond it. For example, onboard our ships which have been brought into service since 2007, we process our waste water in biological membrane purification plants up to almost drinking water quality. With these "Advanced Waste water Purification Systems" (AWWPS), we reach a degree of water purity which is not achieved by many of treatment and cleaning plants on land. Furthermore, we take into account where it will be possible forward waste water to licensed disposal specialists and certified suppliers as early as the itinerary planning stage. In order to improve the quality of our treatment systems even further, we collaborate with, among other bodies, the Testing Institute for Waste Water Technology in Aachen. Together we seek out technical solutions that can further enhance the performance of cleaning technology. All of our ships are already equipped with two oil separators. These separators divide the water that accumulates in the bilge (i.e. bilge water) from any potential oil residues. We moreover examine the oil content of the waste water in addition to using a second sensor system called a ‘white box’. Before the international threshold value of 15 parts per million is reached, the white box issues a warning and the discharge of the bilge water is suspended. We hand over the filtered-out oily residues to licensed disposal companies on land or, if this is not possible, to the best available alternative. The following table contains an overview of the various types of waste water and quantities thereof for 2016. The internationally binding provisions and thresholds for protecting the marine environment are governed by the International Convention for the Prevention of Pollution from Ships, or the MARPOL Convention (MARPOL = marine pollution), developed by the IMO (International Marine Organization). All of the worldwide mandatory provisions and thresholds for offshore platforms and ships are set out in this convention. It also defines special or protected areas for various emissions and sets out stricter thresholds for these various types of emissions. 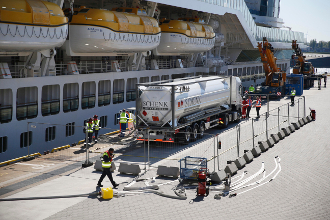 In accordance with the MARPOL provisions, there is, for example, a ban on disposing of untreated waste water within twelve nautical miles of the coast in force in the Baltic Sea. AIDA Cruises signed a declaration of commitment as far back as 2008 not to release any untreated sewage anywhere in the Baltic Sea. We supported the CLIA in carrying out a study in 2016, the intention of which was to highlight where action was still required on land in order to expand the capacity of facilities to accept waste water before the stricter HELCOM thresholds came into force. Every drop counts! Conserving water, one of the most important resources on our planet, is an important issue for AIDA. Through the use of water-saving devices, we have been able continually to reduce the daily onboard consumption of fresh water per person in recent years. Thanks to our levels of expertise, AIDA currently has the lowest per-capita consumption of fresh water in the entire cruise industry. The toilet flushes on board our ships function using a water-saving vacuum system that consumes just one liter of water per flush cycle. In 2016, we were able to reduce our fresh water consumption from 168.6 liters per person per day to 163.3 liters in comparison with the previous year. On board our ships, we transform seawater into top-quality drinking water for our guests and crew through the use of reverse osmosis systems. If this is not possible, we fill the onboard tanks with clean drinking water while docked in a port. In order to do so, we are mindful to check the availability of water on land during the route planning stage, as we are aware of the importance of conserving drinking water reservoirs on land. AIDA Cruises principally focuses on producing its own water on board in order to conserve water levels in land-based reservoirs, especially where less water is available in general. We have been able to implement improvements in our fresh water production processes through the use of reverse osmosis systems. By adjusting our consumption to the amount of water actually required, we save the energy required to produce the fresh water and consequently also save fuel. The latest round of improvements is ongoing on AIDAvita and AIDAaura. 9 of our 12 ships are fitted with a state-of-the-art vacuum food waste system for food waste, which uses considerably less water than conventional systems. Instead of waste being flushed away with water through pipes, we route it to the designated storage tank via a vacuum suction system. Hand towels, bed sheets, tablecloths, clothes and much more are laundered on board every day. AIDAprima and AIDAperla are the first ships to have an on board ‘tunnel washer’ installed. This machine uses just 2.5 liters of water per kilogram of washing. In comparison with conventional household washing machines, which consume an average of 9.9 liters of water, this represents a considerable saving in resources. An on-board tunnel washer saves around 23 million liters of water each year – that’s enough water to fill 9.2 Olympic-sized swimming pools. Alongside protecting the environment and our climate, we are also committed to maintaining biodiversity. AIDAstella, AIDAprima and AIDAperla are fitted with a state-of-the-art system for treating ballast water. The modern ballast water treatment system on these ships meets the IMO D-2 standard for ballast water treatment and is operated without the need to use UV lamps or to add chemical substances. No dangerous waste is released. In 2013, AIDAstella met the standards of the IMO Ballast Water Convention* more than four years before the convention was due to come into force. A wide range of organisms can regularly be picked up with the ballast water, which helps to stabilize a ship, as the ship travels to its various destinations. These microorganisms, of which plankton is an example, are released again when the ballast water is discharged. The challenge in this regard lies in stopping the species and organisms that are picked up with the sea water from being introduced to ecosystems in other parts of the world, in order to prevent them from colonizing there, spreading and suppressing native species. Treating the ballast water on board our ships helps to prevent these organisms from being relocated to where they are not wanted. *) In order to protect sensitive ecosystems and prevent microorganisms from spreading out of their native waters, in 2004 the IMO adopted the International Convention for the Control and Management of Ships' Ballast Water and Sediments, or Ballast Water Convention for short. The convention contains guidelines, criteria, thresholds and testing methods designed to avoid the unwanted introduction of marine organisms, pathogens or sediment from entering foreign ecosystems via ballast water. The IMO’s Ballast Water Convention will initially be binding exclusively in waters controlled by the USA and the Republic of Ireland. AIDA Cruises is involved in various research projects that aim to drive forward the development of new technologies to assist in protecting the environment. We have been involved in a project called ‘Toplaterne’ since 2009, which is part of the e4ships flagship project and is concerned with assessing the ecological, technical and economic impacts of the use of fuel cells on board ships. Another essential component of this project is the formulation of rules and standards for the approval and installation of fuel cells on ships and the use of low-emission fuels. The introduction of lower-emission, gas-powered engines on board can be realized more quickly than the development of fuel cells. In 2017, we embarked on a new phase of the e4ships Pa-X-ell 2 project concerned with preparing practical tests. The plan is to test the use of fuel cells on board our newly-built ships, the first of which will be commissioned in 2018. In collaboration with the Testing Institute for Waste Water Technology in Aachen, we are exploring the technical possibilities that would facilitate improvements in cleaning performance on our ships. The NAUTEK project, which AIDA supported right up until its successful completion in 2016, addressed the possibilities for processing, cleaning and reusing waste water on cruise ships. NAUTEK delivered promising results and entered a new research phase in the form of its CLEAN project. CLEAN focuses on recovering waste water produced by ships in order to harness its organic components for the production of biogas. We have launched a project together with our partner Futouris e.V. and several other companies that is centered around the sustainable procurement and recovery of foodstuffs on board cruise ships. In 2016, analyses were carried out on board our fleet, which looked into possibilities for reducing food wastage even further. One of the results to emerge from these tests is a guideline that informs employees working with foodstuffs about the sustainability of those foodstuffs.